Tuesday Morning, a contingent from Upic went to the Freestore Foodbank to help with the annual Thanksgiving Food Distribution. Hunger is a problem that continues to impact the community all year long, and we’ll continue to work with the Freestore Foodbank and other area nonprofits to ensure everyone has access to a safe source of nutritious food. I wanted to take a moment to reflect upon the experience and thank those on the Upic team who were able join us, along with the hundreds other volunteers and we worked with. One person at the event asked, “I wonder if anyone receiving food donates their time back to the Foodbank?”. The reality is, many of those receiving the food and other support provided by the organization don’t have the time and resources needed to give back — they have problems bigger than most deal with on a daily basis . They don’t want to be in line, they have to be in line. They need help to get back on their feet, so they too can give back to the community. Solving hunger requires all of us to work together, and Upic will be part of the solution. 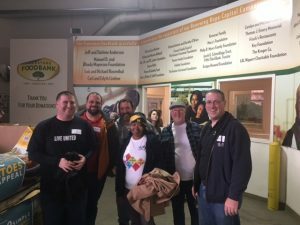 This was my first time volunteering with the Foodbank having contact with their customers, and got a chance to see firsthand how our donations of money and time impact the community. We have sorted food before, a critical behind-the-scenes role without customer contact. In-person, you can see both the need in the community to address hunger and get a glimpse of the problem scale, but also see the positive impact on the faces of those served. I am thankful for the Upic team. Our team of United Way members, vendors, volunteers and staff genuinely want to help others. Whether it’s in our daily work or when volunteering to help the local community. Together we are making the world a better place to live, and improving the lives of those in communities everywhere.